A dense, rich, gorgeous nose. Woody and tropical and slightly floral: Leather, heather flowers, lavender, dried peach, dried apricot, dried papaya, light sweet smoke (wood smoke/char rather than vegetal peat smoke), custard. The palate is quite smoky, and rich – fire roasted chickpeas, lots of dried fruit, oak – ever so slightly astringent, in a good way - tannins and tobacco play in lightly. Finish is lightly smoky, vegetal, dry – still lots of tropical fruit and dried fruit. There’s a growing richness and smokiness, a flourish of spice, and I get some more tobacco oils (like the finish of a good cigar, a few hours after it has been smoked). Nice review, your review of this batch parallels my first experience with Amrut CS quite well. @Robert99 had me try a small dram from his bottle nd despite my palate fatigue, I could perceive a good dose of dried tropical fruit and smoke, it was such a treat. While some Amrut releases do provide quite a bit of oak or barrel play, I find it possible to still get a feeling for the distillates character, unlike the Kavalans I have tried that seem to rely heavily on extraction. What your take on this? I went out and got this whisky after @Nozinan wouldn't stop talking about it. He was right. Batch 12 was awesome. Oddly, I was surprised that it wasn't more peaty - but I'm an Islay lover, so my benchmark is on the high end. All the barley in the whisky is from Scotland, peated to 23 ppm. The nose is woody, floral (in a dried flower sort of way), vegetal, and peaty with dried fruit and caramel- quite an interesting one here weaving together some very interesting flavor camps. Strong peppermint (like candycanes) too, alongside the rich oakiness. The mintiness, is, in fact, almost like the menthol-like nature of freshly milled green cardamom when amidst the various spices here. But of course we have so much more: dried apricot, dried pear, dried hibiscus, apple seeds, apple sauce, and almost a general mixed bag of spices that all meld together – cloves, cinnamon, saffron (particularly), black peppercorns…This isn't aged long but feels as though it is full of fabulous age - that Indian climate certainly does its work! Not overly peaty, though the earthiness and light smoke are certainly around, especially towards the end of the palate. Complex, interesting, and very nice. With water, it grows a bit, and apple emerges more fully....but I like this one at full strength more. A winner. I've kept coming back to this, and served it blind at a number of tastings - and it's always impressed. I even served it blind to a whisky writer who's had over 10,000 whiskies and he swore when he found out it wasn't Scottish. Haha! He loved it, too. By the way, thanks @Nozinan. @Victor No wonder you seemed a little tipsy...2.5 years...a very long session! Now and then one might get the feeling that one is launched into another realm of consciousness. Most of the time it is an illusion. This time I know it is an illusion too, but I do not care at all. Yes I am thunderstruck. I jumped out of my skin. It may not be the best whisky in the whole wide world. No, it is not even the best whisky of the subcontinent of India. So I am told. This is a tidal wave. Although I admit it does not urge Noah to build an ark. It really punches right between the eyes. Amrut Peated Cask Strength is the whisky of this review. It is well known. I cannot help it writing about it, because it is truly amazing. Its nose is impressive . It is full of smoke, it is very sweet. It is salty. It reminds me of exotic fruit, cinnamon and white pepper. Its palate is aggressive and rough. It is spicy. Cinnamon. Nutmeg. Curry. White Pepper. It is fruity. Bananas. Cherries.Mango. Oranges. Very smoky .Lots of liquorice. A little too sweet. Holy Cow, someone once said this Amrut is like Agni, the Hindu God of fire, in a bottle. I agree. Yeah, I agree. If you like Lagavulin 16 , you will love this tidal wave from India. @KRB80 I've never tasted an Amrut that I didn't like. Of the 3 batches of regular CS I've enjoyed them all, especially the 2007 edition. @NamBeist Thanks for the reply. I'm not huge on sherry bombs. The only sherry bomb that I appreciate is Abunadh and even then, I have to be in the right mood for it. However, you've peaked my interest on the Peated CS now. @Nozinan RE: Amrut CS: Initially, I thought it was decent but it seemed to develop a very bitter quality to it that I couldn't get past. The Portonova sounds interesting as well, tbh. I had tried this one some five years ago, but it gives me great pleasure to revisit it. It was bottled in 2009 and was a one off release of 3000 bottles. It was distilled from locally grown barley from Rajasthan. The first whiff catapults me towards Islay. This reminds me a bit of Laphroaig or Lagavulin (well, the peat is imported from Scotland), but with a twist. Think leather, curry, humus, freshly sawed wood and a touch of rubber. But it also has a sweet side with candied orange peel. Yes, I really like this. It is better than I remembered. The attack is quite sturdy. No surprise there. Immediately fruity and smoky (camp fire!) at the same time. Curry, nutmeg, ginger and a whole range of peppers precede leather and a mildly bitter orange marmalade. Toffee and caramel play an important part too. The finish is very long and keeps your mouth warm for many minutes. I should have bought an extra bottle when I had the chance. With winter upon us, this would certainly keep me warm. Have you tried the Ashok manoeuvre? 5-10 minutes of warming the (covered) glass results in a magical burst of flavour. I experienced this in the batch 12, from 2012. I'm not sure why your bottle was marketed as a one off. The batch 1 that I have was bottled in 2008. Curious. I also have a "special limited edition" of the unpeated CS but then @MaltActivist found an earlier bottling of that one. I suppose the only important thing is the quality of what's in the bottle. Anyone know where this can be found today? Especially, I'm looking for an American shop that ships to the US states that allow it. And did they smoke INDIAN barley with SCOTTISH peat? Interesante! The tales of peated Amruts always involve some weird cross-breeding between ingredients from the two places, but it's hard to follow sometimes. I thought at least some of their stuff was made from peated barley that was entirely imported from Scotland, not just the peat in isolation. The Amrut peated CS is a real powerhouse. Big ABV, Big flavor and Big personality. I can definitely see why so many enthusiasts are falling in love with Amruts whisky. Initially the nose is a little spirity, not shocking given the very high ABV. In a matter of minutes though it settles down and becomes almost a bit shy. Firstly I get some crisp sweet vanilla and fruit. It is not that heavily peated but the smoke is noticeable and it is both aromatic and peaty. The development of the nose is ongoing and adds cedar wood, peat, custard, parma ham and some savory spice - perhaps cumin. Adding water revs the nose up again and it is back with a vengeance. Peat up front! White pepper corns, over-ripe mango, smoked pineapple, spicy cardamon and banana. A hint of kippers and a saline quality like seaweed chips. A faint and pleasant whiff of chlorine. Palate The palate offers peat, salt and a subdued smoke. spicy charcuterie meats and sweet baking spices. When I first had this at a recent tasting I was completely blown away by its massive power. You take a sip and a second later it literally explodes in your mouth, not for the faint of heart or those looking for something light and easy. The finish is lingering with peat smoke and salty dry white pepper. At first it is faintly bitter but as it dies it goes out with sweet and salty fruits. And it certainly takes its time to do so. I have a few years' supply. I'm sure if I visit Australia I will visit Sidney, and if I do I will be sure to check with you first and maybe bring a sample (though I'll have to check out the rules, I know AUS is a bit strict). @ Van pelt, it has been a few months since I tasted this Amrut, but I agree with Victor and Nozinan's comments. It is not comparable to the big medicinal or peppery peat from many distillers. A very peated highland park and I would add other Highlanders such as very peated or more mature Old Pulteney or Oban are excellent comparisons. Perhaps because it lacked a lot of the big peaty flavor profile I expected, I dismissed it initially, several of my in laws really liked it! I will need to revisit this Amrut, with some oxidation and appreciation for non-Islay peat, in a few months. @vanPelt, you may be right about the peated barley importation. I don't know about that. I do know that they otherwise use local barley. 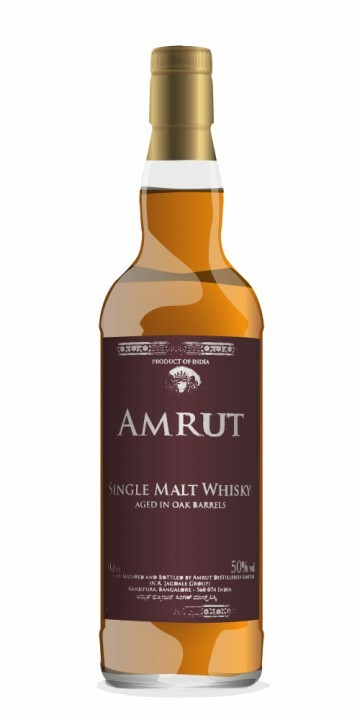 About the barrels, my point was that Amrut uses a good bit of new oak maturation, and does not, like the Scots, routinely use re-used barrels for 100% of their malt maturation. Sounds to me like you need to taste the Amrut Peated Cask Strength for yourself. To me it doesn't taste like anything from Islay. Closest Scottish comparison? Maybe a very peaty Highland Park with no wine influence. I have made no secret that I am a big fan of Amrut. This is not an original opinion. I got the idea to buy Fusion either from Ralfy or from a review in the Globe and Mail about 3 ½ years ago. Since that time I have tried 8 different expressions, and I have enjoyed all of them. This one is either my favourite or next to it. My first taste of it was at Spirit of Toronto in May 2014. I had intended to buy it when it was released in Ontario, as it was my favourite of the 5 at the masterclass, but when was available I confused it with the single cask expressions and was waiting for the single cask Peated CS, which, of course, never arrived. Thankfully I was able to locate a couple of bottles in Richmond Hill in December, the month in which this bottle was opened. This malt is reviewed a little differently than my other reviews. At S.O.T. , Ashok, the brand ambassador asked us to warm the glass after initially nosing. The result was what several of us described as magical. Although it is harder to replicate this with a Glencairn than with a stemmed glass, I’ve done my best. So this is reviewed at room temperature, warmed by hand, then with about 3-4 drops of water to a 15 cc pour (left to sit for about 15 minutes). Room temperature: Hint of smoke. Caramel. Tropical fruits. After warming: richer nose, gentle peat, stronger caramel, fruit more subdued With water: Pineapple hits you right away. Vanilla and caramel are still there, peat is in the background. Room temperature: Fruits, peat, hint of chocolate. Pineapple. Sour note. After warming: Explosion of flavour, sweet and sour, vanilla, caramel, some milk chocolate, sweet peat. With water: very fruity, a slight alcohol burn (but mild enough to be pleasant), peat is in the background. Warming it brings the peat back front and centre, and it feels like honey-syrup on the tongue, sweet (but not cloying) with the caramel and vanilla flavours accentuated. When warm the alcohol burn disappears. Finish: Neat the finish is long, dry with a slight sour note. This one goes well with milk chocolate, specifically Trader Joe's Belgian milk chocolate. This is a fantastic single malt… one of the best I’ve ever had. I rank it up there in enjoyment with A’Bunadh and Bladnoch, though of course it is completely different, which is good, because it means more variety of excellence. This is one I would love to stock up on, especially this batch, which is (to me) proven. I have asked my local LCBO to bring some in and I intend to get my hands on a healthy supply. Hopefully enough to part with a bottle as a trade or a gift sometime. @Nozinan, thanks for a lovely passionate review. Every last one of those Amruts going to the Liquor Control Board of Ontario presented at Spirit of Toronto 2014 was delicious. So far, out of 12 Amruts I've tasted the only one I didn't like was that one ringer bottle of @dbk's Fusion. @dbk gave an entertaining review and comment trail on that one. There must have been something wrong with that whole batch, I expect. I've had samples from two other bottles of Fusion, one of which was astoundingly good, the other just ok. What I take from this is that there is perhaps more variation in batches of Fusion than in the other Amrut whiskies. I wish you the best of luck, @Nozinan, at putting away several bottles of this Amrut Peated Cask Strength, batch 12. I want to drink some more of it in the future! About glassware, I have lots of Glencairns, but I consider them to be mediocre at best for quality of nose and palate. In my experience almost every other convergent glass I've tried gives superior nose and palate tasting experiences compared to Glencairns. The big bowled glasses seem to give the best results of all, but they are impractical for all but home use, because of their size, fragility, and difficulty to clean. I've settled on stemmed brandy snifters as my standard home whisky tasting glasses. @Nozinan It is ideal for a pour of 1 to 1 1/4 oz where you have maximum air exposure. For me this glass is only needed when you want to get some heavy notes out of the way but I haven't tried it with very light whiskies. But what I found is that when the heavy notes are not overwhelming, the whisky will smell light and dull. I guess, it would be very good with light whiskies at high ABV. An another way to see it is that the whisky will oxidized itself faster in the Neat Glass. For example, with the Farclas 15 the gentle wood spices came faster and so did the cherries and the almond. The alcool, the chocolate and the malt were pushed backward. Generaly speaking, I find that this glass as the biggest effect on the perception of the malt. With the Glengoyne 10, for example, the malt seems less bitter, more smoky and fruity. So even if the Goyne is at 42 ABV, I sometime prefer it in the Neat. If I want the Goyne to smell velvety rich and even taste velvety rich, I will use my Glencairn. Two last comments. Of course you would have no problem to warmed your pour with it and if you want the heavy notes back a bit, just incline the glass as if you were preparing to have a sip and plunge your nose in the glass. It quite surprising the first time. As the sip itself, because of the shape you really have to incline the glass more than usual and the liquid hit your tongue with some wideness which is strange at the beginning for a sipper like me used to a thrickle. Ok, so Amrut is one distillery that has a very special place both in my heart as well as in my bar..possibly because its Indian to start with. Secondly and more importantly it has consistently been bringing out some very tastefully made expressions which has been a delight to savor. Adding a few drops of water brought some banana and caramel for me.. The Verdict: One more Amrut that has exceeded expectations!! Have this ONLY at cask strength to enjoy it the most.. Slainte!! @nozinanb ...:) I guess the best part about this CS is that even at high ABV...the flavors came out so well.. and none of them were over powering.. don't you think?? Amrut distillery was founded in 1948 but it was not until the 1980ies that the company began to produce malt whisky. While the barley is grown in the foothills of the Himalaya the whisky is matured in Bangalore. Due to the tropical climatic conditions the whisky matures very quickly: three to five years in Bangalore are apparently considered to be the equivalent of ten years in Speyside. This peated, cask strength version has been distilled from Scottish peated barley with peat levels of 23 ppm and is part of Amrut’s core range. The nose is astonishingly multifaceted: it starts with distinct grainy flavours, followed by vanilla ice cream, a healthy dose of caramel, hints of butter as well as of salt and seaweed. All in all this is a complex nose, very well balanced, but not easy to grasp. The palate is full-bodied and spicy. While sweetness is present at first, it gets more oaky later on, accompanied by notes of nutmeg. Peat is present but not overwhelmingly so. With water the whole becomes astonishingly flat. The finish is of medium length, warming, and spicy. Lovely bonfire smoke rounds the whole off. This certainly was an unusual single malt, with flavours that were challenging to grasp but very well balanced overall. I greatly enjoyed this, much more so than the ‘Fusion’, to be honest. What is more, this is very drinkable at cask strength, and in fact I prefer it without adding water. This is the other Amrut I picked up – 3 sample bottles of 50mL. I have tasted it on three different occasions. The first night it went up against Amrut Fusion 50% and the standard Amrut Peated at 46%. This was the clear winner for me that night. The second time I put it up against Laphroaig 10yo CS Batch 002 56.3%, Ardbeg Supernova SN2010 60.1% and Octomore 1.1 63.5%. The third time I put it up against Ardbeg Still Young 56.2%, a Kilchoman Single Cask at 60.3%, and Octomore 1.1 again. Here is the thing. I never look at my previous scores. The tastings were far enough apart that couldn’t remember what I had scored it at last (let alone how I scored the 5 categories I use). And in all three tasting the score for this Amrut was consistent: 88.5 then 89 and then 89 again. So this a compilation of my tasting experience with this guy. Nose: Very fruity and malty. Fruitiest of the night: dark fruits like dates, raisins, black cherries and dried plumbs. Compared to the big cask strength bruisers from Islay this is less peaty by far. This reminds me of a desert peat (or it might just be my impressionable imagination). Perhaps a hint of sherry and blood oranges in the background? But very simple and delicate compared with the others. Definitely a baritone peat tone. Simple, but very enjoyable. I would have liked a touch more peat. However, time really reveals the fruit behind the peat. The fruit and malt are on a gigantic bed of peat. It is a very dry peat – desert peat! (Very fruity with dry peat) With water reduced to 46%: Wow! Way more lemon cake and citrus. There is more peat and smoke as well. Still fruity. Same score. Taste: Very fruit forward. Everything on the nose is here on the tongue. Now the peat and wood are creeping up on you: sweet dark purple fruits, and some honey and peat. It is nice in a sherry type way, but very quickly it becomes even more intolerable in the mouth then the Supernova. Nice while it lasted. With water reduced to 46%: Way better. The fruit, honey and peat are all still there. But the salt build up is way diminished. Lovely. Some very interesting spices that I feel like you will only find in India . . . nice indeed. Finish: Nice intake of breath then a huge salt searing peat explosion of sand, peat, and strange spices that are both sweet and bitter rip through your mouth. Now a second wave rips through you. Amazing. Luckily the searing salt doesn’t last forever . . . but it is really overpowering. There are some sherry hints and other dark fruity notes that go well with the searing desert peat storm. It is truly a sand storm of biblical proportions on your tongue. With water reduced to 46%: More dark fruit and sherried then anything else tonight. It is a nice balance of peat and fig compote. Much more accessible with water but you lose that amazing intensity in favor of huge Indian spices. It is a trade off so the score stays the same. Complexity, Balance: Amazing complexity for such a very young whisky . . . from India! I like it. This would be the one I would buy. This reminds me of a fruity highlander, but with peat. All that fruit is very odd. It is balanced between peat and fruit, dry desert and juicy fruit – and I like it – but next to a young peat bruiser from Islay this is the odd man out. Aesthetic experience: As with the Amrut Fusion the label states proudly that it is Indian while at the same time standing firmly in the Scottish tradition of whisky. I liked the green trim on the standard peated Amrut version better then the gray on parchment of the cask strength version. However, I LOVE that that it is cask strength AND at 62.8%!! This is a monster of peat and I love it: not much to hate here. Availability and price? Conclusion: So I really like Cask Strength whiskies. I also love Peat. No secret. I am biased I this way. This has both. It is also a wonderfully different take on peat from Islay and I LOVE the variety. The score for me is a “buy again.” Here is my problem – price (sad to say). The only places I have seen it have it for $75-$80 a bottle. I can pick up Laphroaig 10yo CS or Ardbeg Uigeadail for around $60, and Ardbeg Corry for $72. – all scored much higher for my enjoyment rating. So while I would love to have a bottle my only reason to buy is for the sake of variety – and when I am feeling a little free with my cash. And that probably won’t be anytime soon. I can always use a few more bottles of Uigeadail or Laphroaig 10yo CS around. Still, one day the stars will align and I’ll pick this up. If you love peated Cask Strength whiskies like I do . . . try it.